From left to right: Heidi Hogg, genetic counsellor; Kimberly Dornan, genetic counsellor; Natasha Lemiski, genetic counsellor; Stephanie Desmarais, genetic counsellor; Mary-Ann Wiens, clinical clerk; Paulien Van Galen, genetic counsellor. Missing from photo Renee Perrier, geneticist. Photograph by Jared Sych. It’s a bit of detective work, a bit of cutting-edge research and a lot of one-on-one counselling — all under the title of the Hereditary Cancer Clinic team. 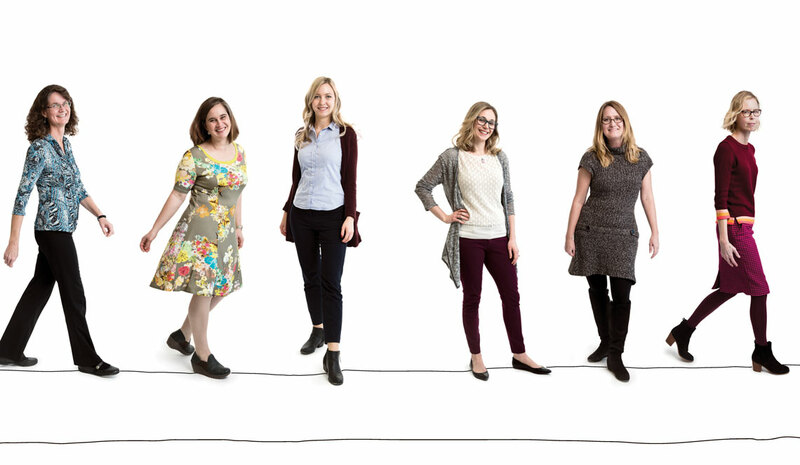 From its office on the third floor of the Alberta Children’s Hospital in Calgary, this team of genetic counsellors pores over family histories, looking for Albertans who carry genes linked to hereditary cancers. “If we can identify someone through their family history and give them the opportunity for genetic testing, it’s empowering for them,” says Paulien van Galen, a genetic counsellor on the team. “In many ways, nothing has changed because they’ve had this gene since the day they were born. What’s changed is now we have the information moving forward to be proactive rather than reactive,” says van Galen. The likelihood of hereditary cancer is low — inherited genetic mutations play a role in five to 10 per cent of all cancers, so genetic testing is not helpful for most families. Testing is resource-intensive and can be stressful for families. The hereditary cancer team offers appointments for individuals or families with a history suggestive of a hereditary cancer predisposition. “We want to focus on that piece of the pie and make sure that we can serve that group of families as best we can in terms of screening and prevention,” says another member of this crucial team, genetic counsellor Stephanie Desmarais. Most patients are referred to the Hereditary Cancer Clinic by family doctors, surgeons or oncologists. Agenetic counsellor will then discuss if genetic testing is appropriate and identify who in the family is best to test. If testing is offered, the team interprets the results in the context of family history, both for the individual and their relatives Desmarais encourages eligible patients to meet with a genetic counsellor even if they don’t feel ready for testing. “Everyone deserves to make an informed decision about whether testing is right,” she says. Many genes have been identified that may predispose individuals to developing certain cancers. The most common hereditary breast cancer genes are BRCA1 and BRCA2, which are linked to breast and ovarian cancer, while Lynch syndrome is the most common hereditary colon cancer condition. Historically, the advantage of genetic testing was solely in identifying people who had an increased risk of developing cancer. These individuals could undergo more frequent or specific surveillance or risk-reducing surgery if appropriate. But recently, a new therapy for women with breast or ovarian cancer who have a BRCA1 or BRCA2 mutation — PARP inhibitors — was approved in Canada. “More and more, we’re starting to see an advantage for patients to know up front if they have a specific gene mutation that creates risk in terms of opportunities for screening but also for treatment decisions for patients with cancer,” says van Galen. Research looking at genetics and cancer is changing quickly. That has implications for everyone, says van Galen.